Another miniature finished. Again, a very loose background. I have added a very vague background to this little mini. My thought is that I want you to see the Doberman and not the background. This one is finished. I have started a new woodpecker mini and will post its progress soon. Deuce, the model of many of my paintings has passed. My deepest sympathy to Deuces' best friend, Courtney. Trying to do a miniature on some gessoed illustration board. Its about 2 x 2. Not real happy with this one. I think I will stick to Ivorine in the future when doing my miniature portraits. I have designed and ordered two new business cards for IlluxCon which is coming up shortly. I used the Lawkeepers on one card and the Mermaids on the other. One of my favorite subjects is George Washington. I started this miniature a few months back and set it aside. My Bad! He is now back on track. I am using a postage stamp as my reference. The stamp is a Gilbert Stuart portrait and I have seen the original at the National Gallery of Art. My second Doberman mini, measures 2 1/2 tall by 3 inches wide. My miniatures shows season is just about to begin. I am using my lack of wheels to help me focus on completing a lot of new minis for the season. This woodpecker miniature is getting close to finish. Listening to REM and getting in my zone today. Still no car and it looks like the shop will have to put in another engine. Seems the one they put in this week was defective. I may get my car back next week. In the meantime, I am getting lots of paintings finished up and starting new ones. Today I made a fantastic discovery. I always thought I was a mediocre watercolorist. Always used cold pressed or hot-pressed watercolor papers and hated my results. Today, I used some scrap illustration board (I have lots of it left over what with the illustrations I am doing these days.). The results were very good, considering the artist wielding the brush. The painting is a miniature still life, about 3 x 4 and I will post a photo shortly. 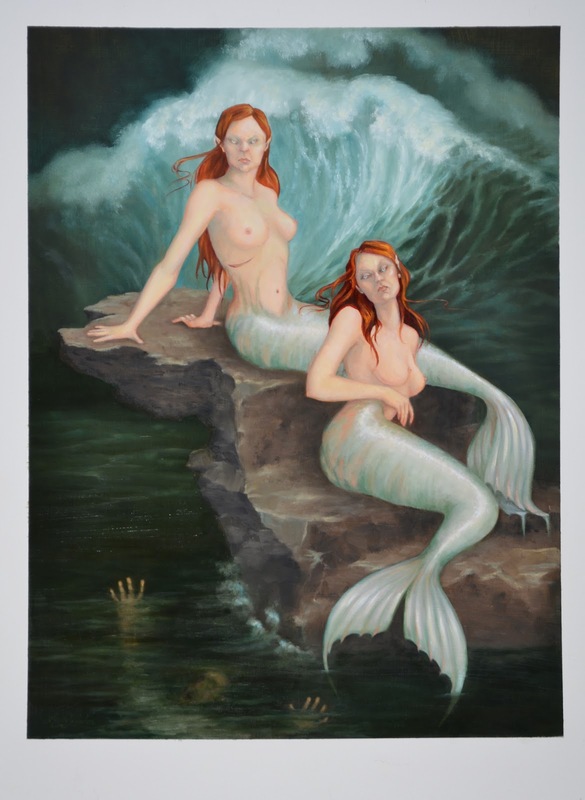 The mermaids are finished and have been entered into an Art Order Challenge. You can see the entry and lots of other finished entries at the Infected By Art website. Wish me luck, friends. With my husbands retirement just three weeks away, we have been super busy getting things squared away for a smooth transition. Also, this month marks 30 years of almost wedded bliss and he has turned 59. As you can see, lots happening here. Started some thumbnails for new painting today. I am starting some new miniatures this week also. My car engine seized up on Saturday which means I can either buy a new car or have someone put an entire new engine in. Either way, I am a prisoner at my own home....I hate not having wheels.